PRE-FINALE EPISODES | The first May sweeps outing, “Law & Boarder” (airing April 28), seems like business as usual, thrusting Beckett and Castle into the world of extreme sports. But the May 5 episode, “Veritas,” based both on its title and synopsis, hints at weightier matter, as Kate’s revisiting of her mother’s murder leads to someone getting killed. 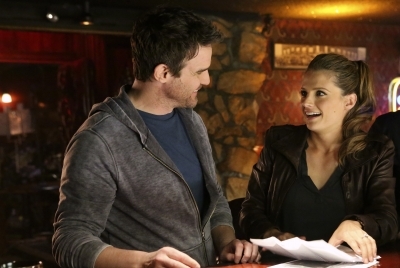 When evidence of the offing points to Beckett, she and Castle become the targets of a dangerous manhunt. MAY 12 SEASON FINALE | Titled “For Better or Worse” and featuring a clergyman among its guest roles, the Season 6 finale at least seems headed for a wedding — though “a shocking surprise threatens to ruin the big day.” How will a small-town hustler (played by Warehouse 13‘s Eddie McClintock, above) who harbors a connection to Beckett figure into the “I do”-or-die hour?